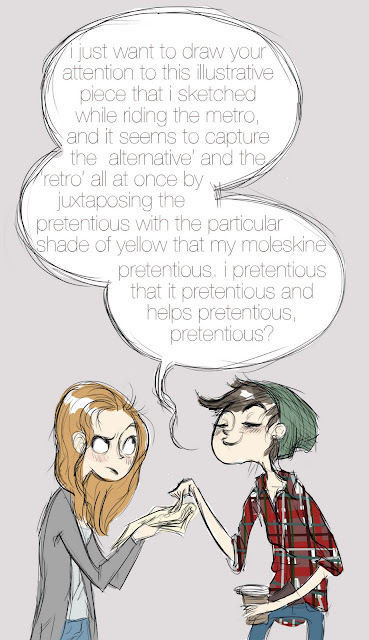 i like that said pretentious individual is ambiguously gendered. male? female? neither? my BEST guess is that it is none other than the: lesser snub-noseicus mac-bookitus, aka the "common purebred pretentious." these are a non-gendered form of human. so wholly pretentious is the common purebred pretentious that over time it has in fact turned asexual and can therefore reproduce with itself, so long as it is nourished with copious amounts of the finest starbucks coffee. I will never understand how hipsters can stay so calm with a continuous supply of caffeine in there systems. Just one cup and I get all jittery like a crackhead in withdrawal. ..but I still drink it.